Do you like Peeps? You know, the brightly colored sugary, marshmallow bunnies and chicks that are sold in the Easter candy? I have learned that people either love them or hate them. I love them, my hubby hates them. It works out nicely for me because it is the one candy I don’t have to hide to keep him from eating it all. A couple years ago I decided to try my hand at homemade marshmallows and I was hooked. They are not very hard to make and are so delicious. 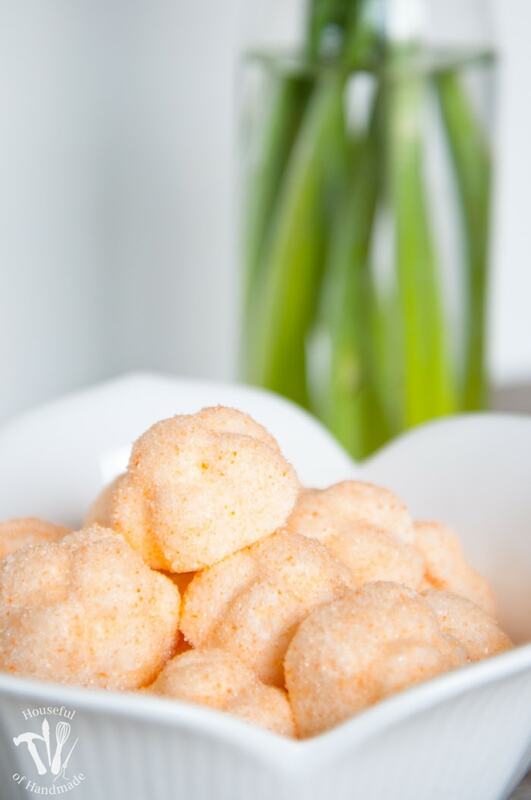 The perfect delicate, fluffy, cube of sugary goodness! And the best part, is you can add delicious flavors to the marshmallow. I mean, real flavor, not the yucky artificial stuff you can get in the flavored Peeps in the store. I tried those flavored Peeps once, and now I steer clear of them. They are so hit-and-miss. Some of the flavors are good while others taste like an artificial, lab-made idea of a flavor. No thanks! So when I came across this Orange Marshmallow recipe from The Missing Lokness I knew I had to try it. 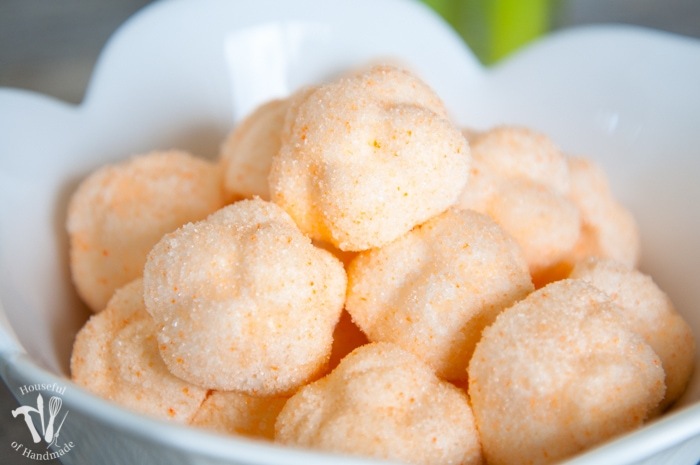 Orange marshmallows flavored with… oranges! That is definitely my kind of recipe. Now my recipe is a little different from her recipe because I was half way through mixing ingredients when I discovered I was almost out of corn syrup. The recipe called for 1 cup and after letting it drip for a minute (while I pounded frantically on the bottom hoping for a miracle), I managed to get 3/4 cup of corn syrup. So close, but with candy making close can mean disaster. I considered running to the store, but it was late and had been snowing all day, and I just wasn’t that motivated. So I decided to use honey for the remaining 1/4 cup of corn syrup and hope for the best. I figured if it didn’t work, I could go to the store the next day and try again. Since the ingredients for marshmallows are inexpensive, I wasn’t too worried about wasting them. And I was hoping it would work because honey and orange are so good together. Well, you guessed it, it worked! Obviously it worked or I would not be sharing this recipe (I promise I will not share a recipe that isn’t totally delicious cause that is not cool). Typically you cover marshmallows in a mixture of powdered sugar and cornstarch to keep them from sticking together, but since it was Easter week and I had been passing up all the brightly colored Peeps on the end of every isle in of every store, I wanted to make these marshmallows into Peeps. 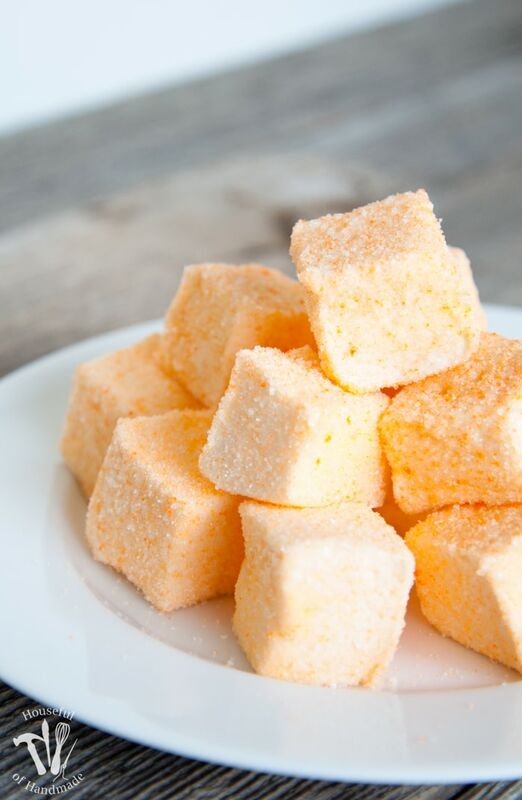 So instead of covering them in powdered sugar and cornstarch, I added a couple drops of orange food color to some sugar and stirred until I had the most beautiful orange sugar, then I pressed all the sticky edges into the sugar to coat and presto: gourmet Homemade Orange Honey Marshmallow Peeps! P.S. After seeing this awesome Homemade Easter Peeps post from Christene at Keys to Inspiration, I knew I wanted to try making shaped marshmallows! I had a couple plastic ice cube trays from IKEA (I know they say water only, but by the time the marshmallow is ready for the mold it is barely warm so I wasn’t worried) and a Wilton Easter cookie sheet that we filled with marshmallows. Make sure to spray them well with cooking spray, but it totally worked. And after filling all three containers with marshmallow, I still had at least 1/2 the mixture left over so I filled a loaf pan almost to the top (should have used an 8×8 pan). Who says Peeps are only for Easter? 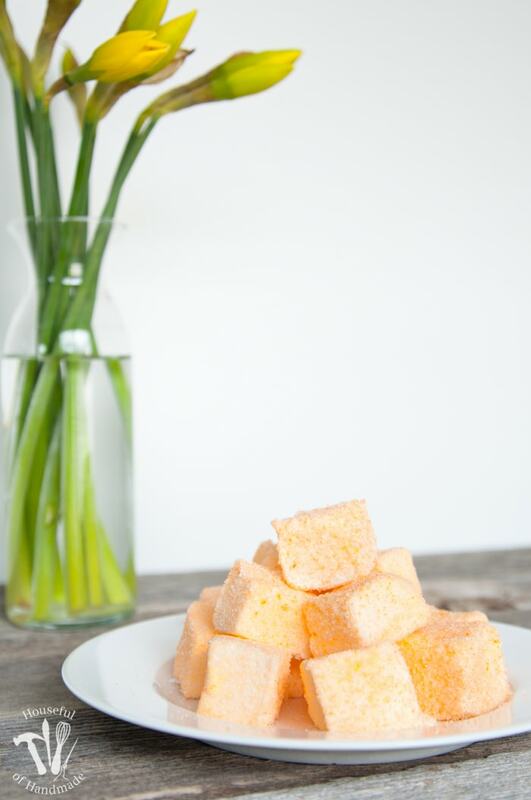 Celebrate spring with these delicious Homemade Orange Honey Marshmallow Peeps. 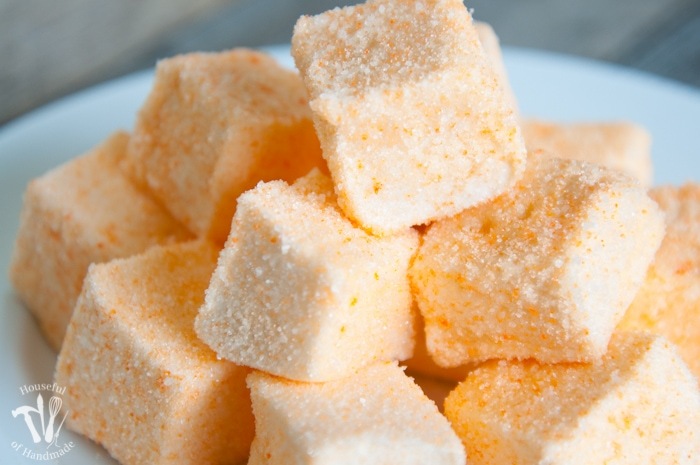 These fancier homemade marshmallows are the perfect spring treat. Prepare your molds and/or pan by spraying well with non-stick cooking spray. In the bowl of your stand mixer fitted with a whisk attachment, add 1/2 cup orange juice and sprinkle with all 3 packets of gelatin. Let it bloom while preparing your sugar mixture. In a medium saucepan, combine 1/2 cup orange juice, sugar, corn syrup, honey, and salt. Heat over medium high heat, stirring frequently while taking care not to scrape the sides, until mixture reaches 240 degrees (soft ball stage). Remove from heat. Turn stand mixer on low and slowly pour the hot sugar mixture into the gelatin. Do not scrape the sides of the pan. Once the sugar is added, turn the mixer to high. Whisk on high until the marshmallow thickens and is cooled (about 12-15 minutes). If using molds, add marshmallow to a ziplock bag. Cut off one corner and pipe the marshmallow through the hole into the prepared molds. Pour remaining mixture into a pan. Smooth the top and allow to set at room temperature 6 hours or overnight. When marshmallow is completely set, prepare sugar for coating by mixing it with a coupe drops food coloring until evenly combined. Pop marshmallows out of the molds and coat generously with colored sugar. Turn marshmallow from the pan out onto greased cutting board and cut into 1 inch cubes with a lightly greased bread knife. 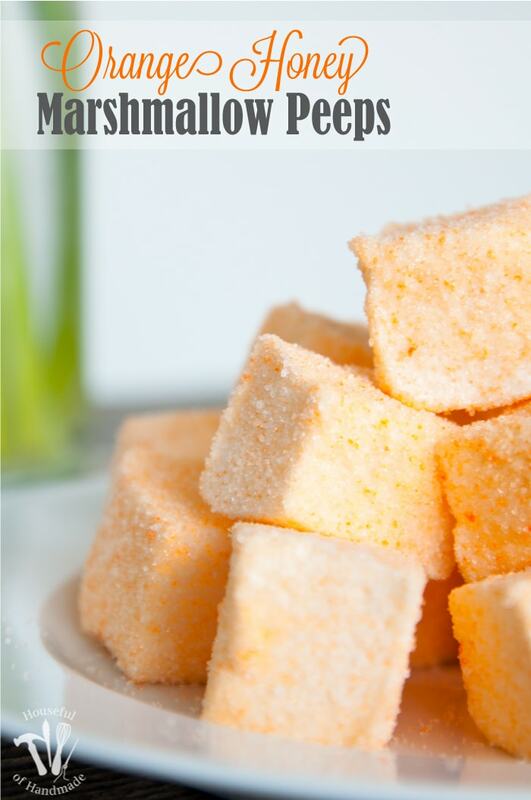 Press cubes into colored sugar to coat all sides. 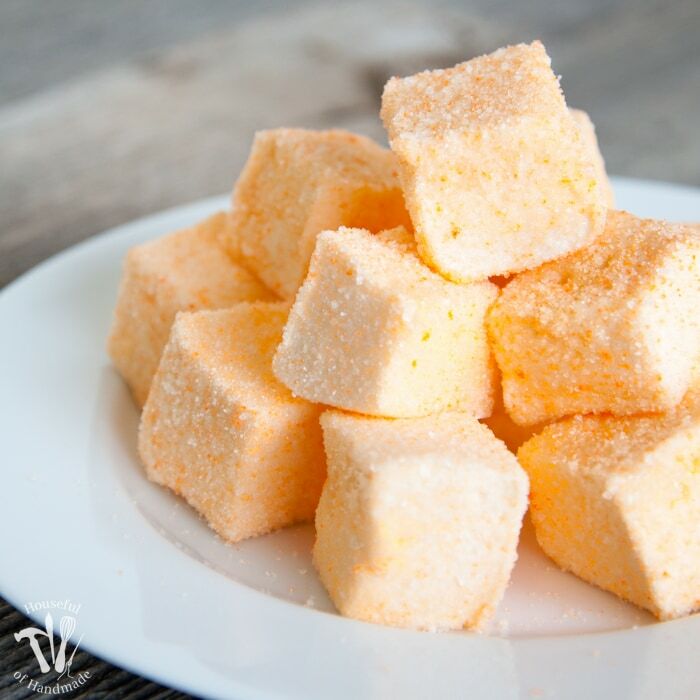 I have never made marshmallows before but these homemade peeps are so tempting! We love the store bought ones so I bet these are amazing! If you love store bought peeps, you have to try homemade marshmallows 🙂 They are super addicting! What a delicious flavor combination and such a gorgeous color!